Lend Lease's Victoria Harbour community has officially opened. Delivered through partnership between Lend Lease, the City of Melbourne and Places Victoria, Library at The Dock has been designed as a centre-point for the Victoria Harbour and Docklands greater community. Cr Arron Wood, Chair of Council’s Environment portfolio said Library at The Dock is a revolutionary addition to Melbourne’s skyline, setting new environmental benchmarks for future developments. “Taking a modern approach through innovation and a unique partnership with Lend Lease and Places Victoria we are proud to deliver Australia’s first 6 Star Green Star-rated public building,” Cr Wood said. “Located on the waterfront of Victoria Harbour and anchored by a new park and children’s play space, the library provides a place for culture, community interaction and learning representing world leadership in sustainable design. The three-storey building is the first public building in the country to be made from Cross Laminated Timber (CLT) which is 30 per cent lighter than traditional structures, preserving the history of the 75-year-old wharf and significantly reducing the building’s carbon footprint. Clare Design, engaged by the City of Melbourne, is the design architect, with Hayball engaged by Lend Lease to undertake detailed design and documentation as architect of record. The building’s design promotes natural ventilation, daylight and fresh indoor air quality, resulting in reduced energy consumption and a healthier, more productive indoor environment. CLT is carbon neutral and offers better thermal performance, requires less energy to heat and cool and generates zero waste. The timber decking and cladding utilises local, dismantled wharf timbers. Library at The Dock reuses water that is water collected from the roof and discharged to a 55,000 litre tank in the nearby Victoria Green park for reuse within the building. Library at The Dock also features 85kw solar panels on the roof, which supply approximately 30 per cent of the building’s total operational power. said sustainability is at the core of Lend Lease’s vision to create the best places and the Library at the Dock is an expression of this. “We take seriously our commitment to create buildings that connect people and place and we are honoured to have been a partner in delivering Australia’s first 6 Star Green Star rated public building,” said Ms Johnston. Places Victoria General Manager Simon Wilson said Library at the Dock would make a valuable contribution to building a sustainable community in Docklands. 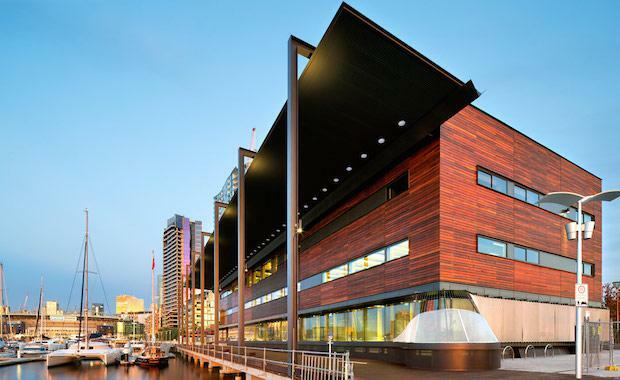 “Library at the Dock also enhances Docklands’ green credentials – Docklands already has the highest concentration of green star rated buildings in the southern hemisphere,” he said. Library at The Dock features a traditional library collection, an interactive high-digital learning environment, study areas and reading lounges, heritage exhibitions, technology hub, multi-purpose community spaces and a performance venue that holds 120 people.